Ah, the beginning of spring. The birds in my backyard resemble some sort of avian retreat with their variety and by their shear amount. I looked out the window in the baby's room which faces our yard and saw five blue jays in one of the trees. Yes, we have three trees in our yard. Actually four if you count the side yard. My wife and I are avid bird enthusiasts, so we went and bought a feeder and Sarah got up on a ladder and hung it. Perhaps the feed we bought is sub-par or word-of-beak just hasn't translated into increased wing traffic because the feeder has been hanging, untouched, since Saturday...sans one Finch I saw there today. What does any of this have to do with the title of this blog? Not much except that when you start to hear the birds and the weather starts to get a little warmer and you walk out with a coat and end up sweating in it, you know that Farmers' Market season is just around the corner. And baseball. Anyway, speaking of the upcoming Market season (see that segue?) our friends from Three Springs Fruit Farm have announced this year's upcoming schedule. In case you are new to this blog, Three Springs is this bloggers favorite place to buy fruit for the family from during the market season. 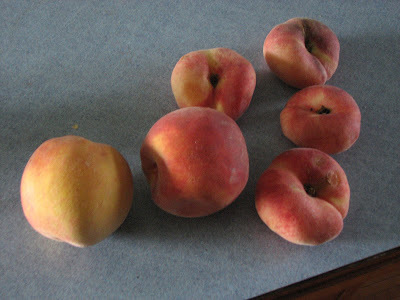 Sarah, Ethan, and I dined heavily on their donut peaches, pears, white peaches, and HONEYCRISP APPLES last year and we are counting the minutes...and hooray, they are going to be at the Piazza at Schmidt's this season on Saturday as well as at the Headhouse on Sundays. Awesome. Here is a link to Ben Wenk's blog post. Enjoy!